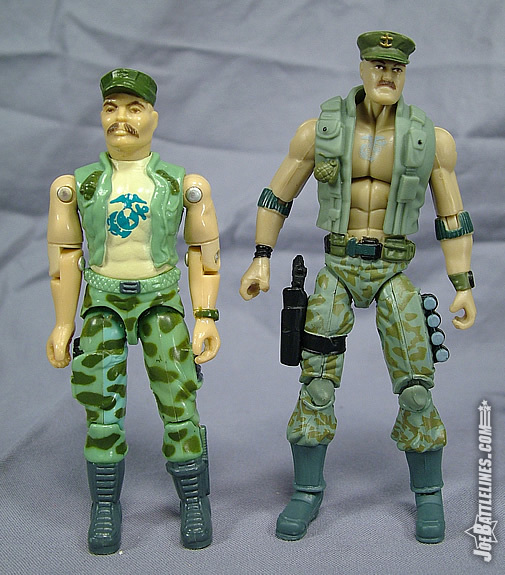 In terms of character design, Hasbro couldn’t have picked a more iconic version of Gung-Ho. 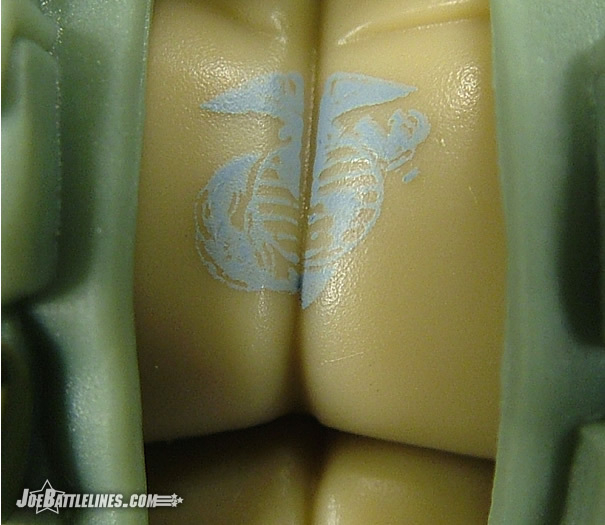 Clad in that peculiar blue-green hue that has baffled fans for nearly two-and-a-half decades, this figure is based solely on the original version of the team’s first marine. 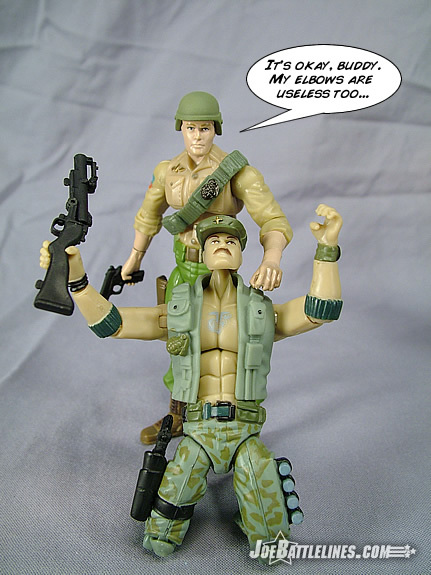 Gung-Ho is sporting his signature bare-chest and vest with a Marine Corps logo emblazoned across his chest and BDU pants. This time around the vest is a molded (and removable) piece with a small hole in the back to accommodate his backpack. 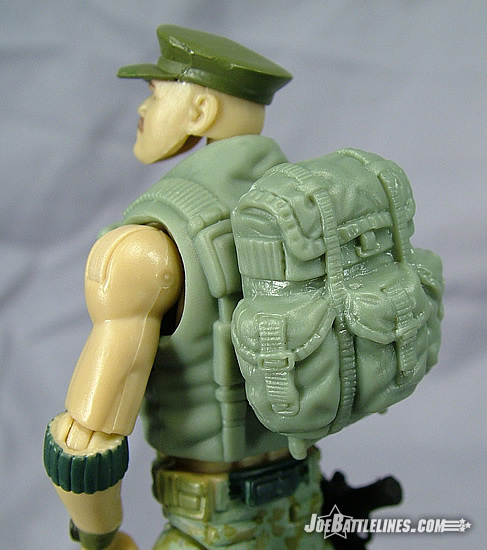 (The 25 th figures do not have a back screw so only certain figures can make use of any included backpacks.) 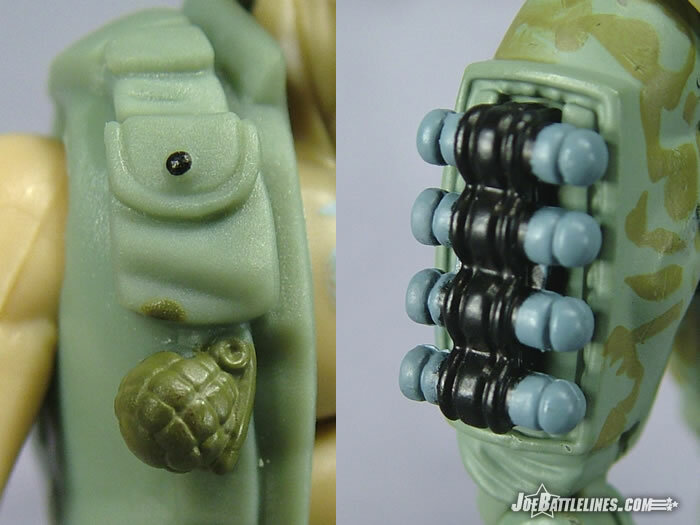 The vest is sculpted with some large cargo pockets and even features a sculpted grenade on the right hand side. This figure, like the rest of the line, features the new “o-ring-less” construction and instead has the new mid-torso joint that is designed to more naturally simulate the movement of the human body. As such, his lower torso and waist are comprised of a single piece of plastic which requires that the waist portion be painted. His belt is highlighted with a few olive and gray highlights. 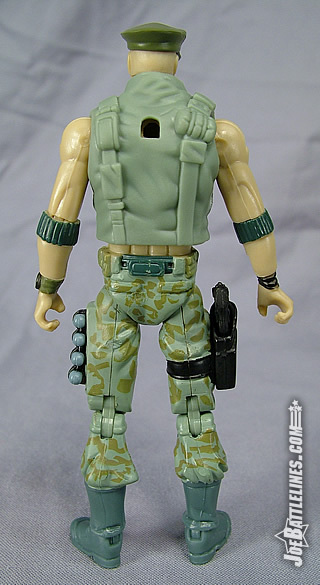 His upper legs are molded in the same blue-green shade as the vest while his lower legs are molded dark gray to match the boots, with the bottoms of his BDU pants being panted on. Perhaps it’s just my figure but the paint applications are fairly sloppy with a bit of bleed-over onto the boots in various places. Attached to each leg are two molded accessories—a holster for the right leg and a group of four grenades for the left. 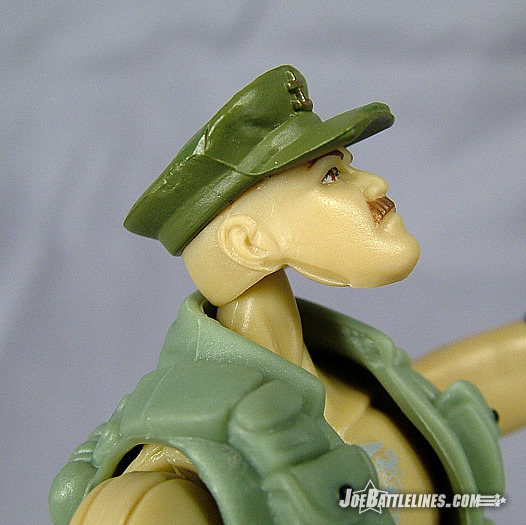 Gung-Ho’s head sculpt is interesting to me as it resembles a different GIJoe character quite prominently. If I didn’t know better, I would assume that this head was originally intended for a Sgt. Slaughter figure due to the extremely pronounced jaw line and the thick moustache. 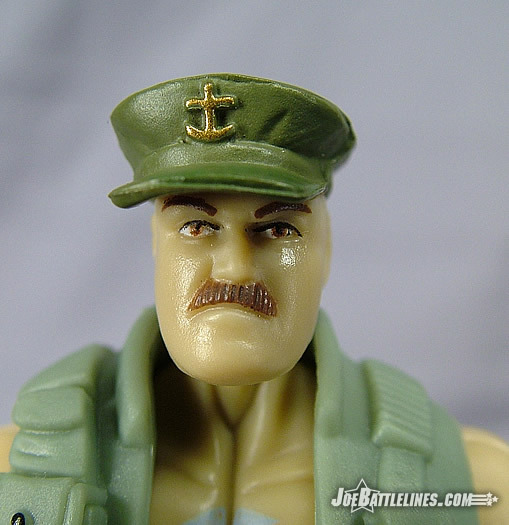 It’s a decent head sculpt but it’s one that just doesn’t scream “Gung-Ho” to me. His signature cap is molded onto his head and features a Navy anchor prominently across the front and is set crookedly across his forehead. I’m not entirely certain why someone who is as proud of his allegiance to the Corps as to get the logo tattooed across his chest would be wearing a symbol of his “rival” service but that’s for the team in Rhode Island to explain. The crooked cap is a bit irritating as I constantly try and straighten it—only to be reminded that is part of the design. What’s odd about this figure is that his flesh tone is far grayer than any other figure released in the line thus far. When combined with his unusually colored uniform, the result is a figure that just looks “off” when compared to the rest of the team. I’m not certain why but he just seems a bit more lifeless than the others—which is odd as I recall seeing prototype pictures of Gung-Ho in a much darker uniform. Frankly, I think this figure needs more contrast in his color scheme as the current combination is quite bland. 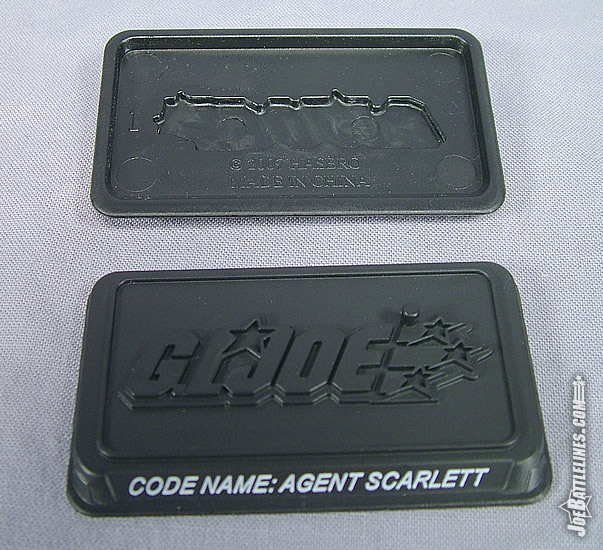 Gung-Ho, like all of the 25th figures comes complete with weapons, a replica of his original file card and a display stand bearing a raised symbol of his “faction” as well as his code name across the front. In contrast to the solid plastic stands of the ARAH era, these stands are merely hollow shells which look quite nice. Due to their hollow construction, however, they lack the weight needed to sufficiently counter-balance some of the heavier figures and, as a result, don’t work particularly well if the figure isn’t placed on the stand “just so”. 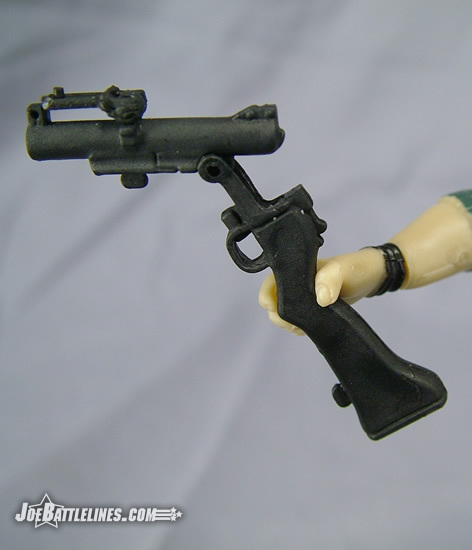 Gung-Ho’s trademark grenade launcher is really quite nice in terms of detail—able to be “broken open” for reloads and featuring a moveable sight. It’s also extremely flimsy and tends to pop apart if the figure is moved about too much when posing. I had attempted numerous times to get the figure to hold the weapon in a pose resembling his original card art but eventually gave up. There’s only so many times I can put the launcher back together before I say “forget it”. If you’re considering buying these figures for children, I’d recommend just removing the weapon entirely before presentation as it will be most likely not survive the encounter intact. This is just another area that reinforces my opinion that these figures are for “display not play”. If you’re read the review of Duke, then you know what’s coming next—my comments on the articulation. 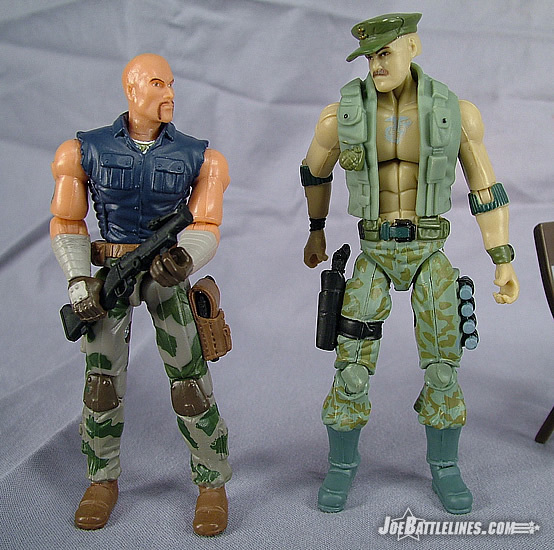 While figures like Roadblock and Snake Eyes are fairly poseable, Gung-Ho falls into the Duke/Cobra Trooper category. His elbows are incapable of any significant range of motion with his right arm actually having less range than his left. 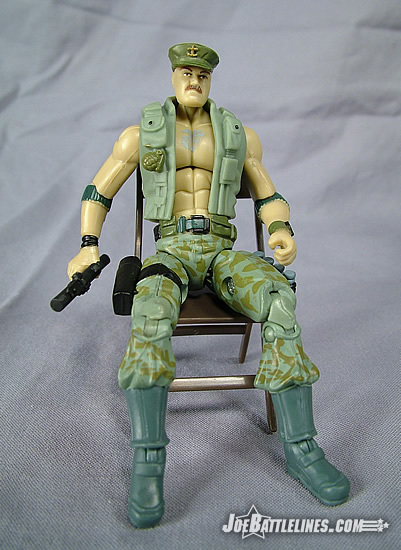 The two-handed grip featured in his original card art is all but impossible with this figure as is any proper sitting position. Gung-Ho features the same double-jointed knees as Duke and it would seem that figures with those knees aren’t designed to sit well. Roadblock and Destro can but the rest of the figures would flunk out of charm school faster than John Belushi. When “improved and updated” figures don’t have the same range of motion as their predecessors, I’m less than impressed. However, my biggest issue with Gung-Ho is actually due to his lack of o-ring. My figure has an extremely loose right hip joint. Right out of the box, he wouldn’t stand without a lot of work, frequently collapsing under his own weight. I tried to use the included figure stand to help but the stands are composed of hollow plastic. The foot pegs are set far back to the right corner which means that they lack sufficient stability to counter-balance some of the heavier figures adequately. Now, had this figure been built on the classic design scheme I could have swapped out the o-ring for a tighter one and fixed his leg. The new design, however, does not allow for this and so my favorite Joe of all time is not only one of the least poseable but he’s also the least stable. 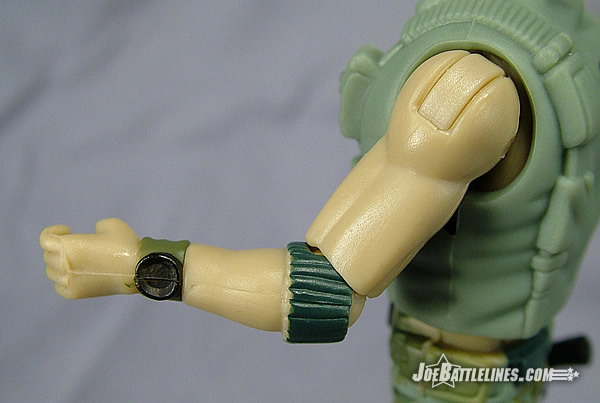 Lastly, due to the extremely soft plastic used to construct his hands and the overly tight plastic bands used to hold his fragile grenade launcher in place, his right wrist is warped and loose. When I tried to remove his weapon out of the package I forgot to bring along a small pair of wire-cutters. Why do I need these, you might ask? 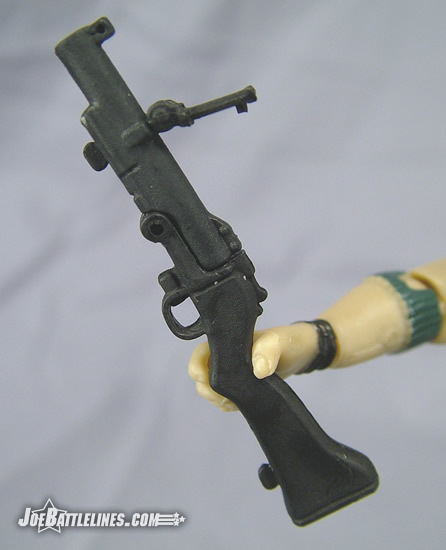 Simple, in order to keep his packaged weapon “in hand”, the factory practically bonded it to his wrist by overly wrapping it in those clear bands collectors love to hate. I tried pulling and attempted un twist it, only to watch in horror as more and more strain was placed upon his wrist. So, he can’t stand, can’t move and his wrist is now limp. Way to go, Hasbro. I’m really impressed with this figure. 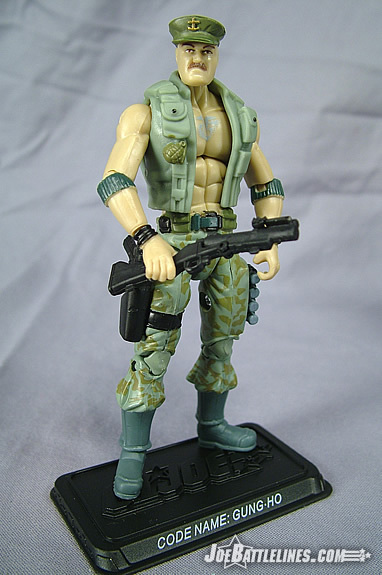 Between awkward colors, low arm mobility, and some lousy QC I’m pretty disappointed that one of my all-time favorite characters in the whole of the GIJoe mythos is the absolute low-point of the first two 25 th Anniversary sets. I was already prepared to have leave Gung-Ho at the back of any display due to his insanely useless arms but now I’ll have to have him leaning on something stable as his hip joint just doesn’t function. 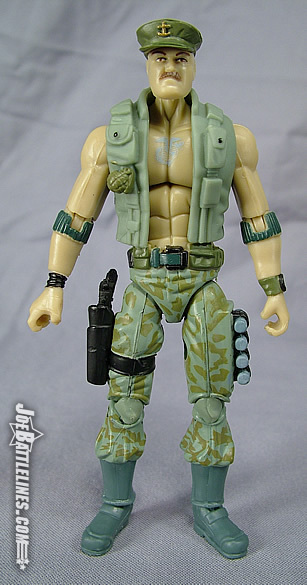 Plain and simple, this might be the worst Hasbro GIJoe figure I’ve opened in recent years in terms of durability. I honestly do not see how these figures are suited to anything other than just straight display in the collection of an adult fan which is a shame. 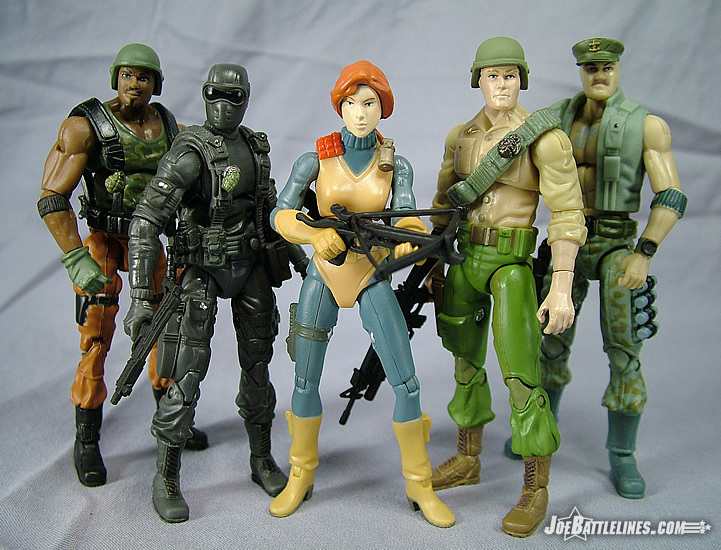 GIJoe, if it is to continue as a toy line desperately needs to appeal to parents and children—just like it did to a generation back in the 80’s. These figures are simply not designed with children in mind which is a complete and utter shame. 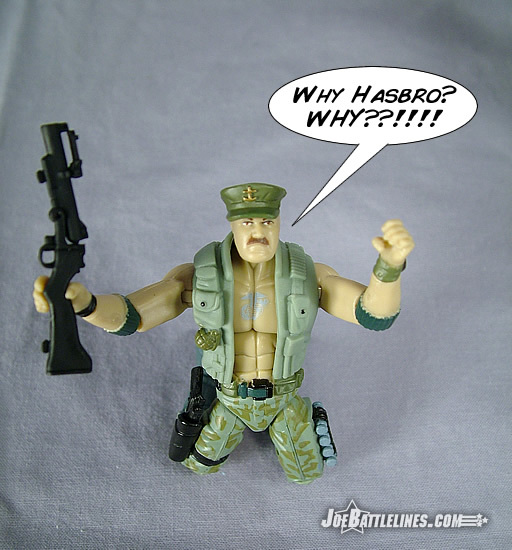 Currently, it’s become “cool” for fans to bash the GvC era of Joes, thinking that the 25 th line is going to blow away its predecessors like the 2009 Camaro would a Model T. Unfortunately, this isn’t the case as the GvC era at least was child and collector friendly, whereas the 25 th line thus far is only favoring the older adult collectors who are a minority of the toy buying public. I can’t honestly recommend this figure in any capacity other than straight display and even then be prepared for an arduous task when it comes to finding an exciting pose for what should have been my favorite figure in the line.